Posted on October 30, 2013 by F.H. It’s been a while since I decided to start a blog, but it’s finally here! Our school invested in iPads earlier this year, with sets being bought for each group of classes. This meant that I was sharing 10 iPads between 3 other classes of Year 3 and 4, with a total of 80 students. This meant that all of the Year 3/4 teachers needed to work together to utilise our timetables to accommodate enough student access to iPads during the week. As many of the teachers were new to iPads, it was also about making them comfortable with using them in the classroom. 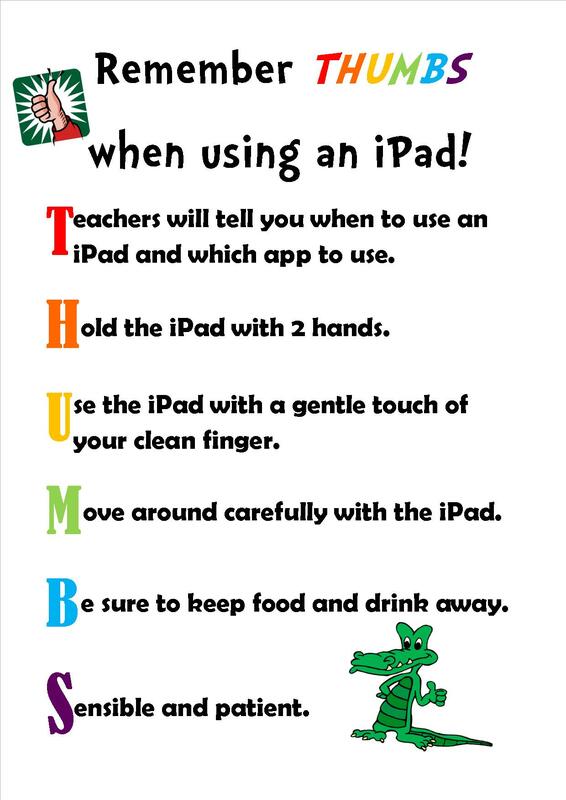 It was important to us that our students were involved in the initial stages of the iPad implentation in our classes, so we established a set of guidelines to refer to in our building. Many of the ‘iPad rules’ posters I had seen talked about not walking around with the iPad, but I felt that limiting movement was also limiting learning, especially with the possibility of QR code scavenger hunts, filming videos and group work. The staff still needed control over apps, especially at the beginning when introducing new apps and giving specific instructions. As a result, we talked to the students and came up with a list of ideas and suggestions. Being the literacy nerd I am, I developed it into an acronym, to be student-friendly and easy to remember! I have found that since displaying this in the classroom that the students are becoming more independent at selecting suitable apps to use, which was the aim. At the beginning it was important to introduce specific apps, but over time and exposure to a variety of apps, my Year 4’s are competent in choosing an app that they think will achieve the set task. It’s a constant learning journey with technology and I’m always thinking of new ways to introduce technology to my class for 2014!